U.S. Bank is one of America’s oldest nationally chartered banks. It was formed on July 13th, 1863 as the First National Bank of Cincinnati. The company has gone through numerous mergers and transitions throughout the years. U.S. Bank is now a subsidiary of U.S. Bancorp, which is headquartered in Minneapolis, Minnesota. It is the fifth-largest bank in the United States with total assets of $448.4 billion in 2016, according to the Federal Reserve. U.S. Bank, which has over 71,000 employees, was named the most admired super regional bank for six consecutive years by Fortune Magazine. As of 2016, the bank had 3,204 domestic branches located primarily in Western and Midwestern America. The bank offers a full range of financial services. Its four core sections are consumer and small business banking, wholesale banking, payment services and wealth management and securities services. According to Consumer Finance Protection Bureau (CFPB) data, in 2015 U.S. Bank had a total loan volume of $27,216,835,000. The company is No. 6 in the U.S. for loan volume right behind Citigroup and ahead of loanDepot.com. Does U.S. Bank Operate in My Area? U.S. Bank offers mortgages in all 50 states. Not all states have physically present loan officers. Use the loan officer locator on the company website to find your nearest representative. What Kind of Mortgage Can I Get With U.S. Bank? Fixed-rate mortgage: The interest rate on this conventional home loan won’t change for the entire life of the loan. This is an especially popular mortgage with buyers who plan to settle into their new homes for the long haul. U.S. Bank offers fixed-rate mortgages in 10, 15, 20 or 30-year terms. Adjustable-rate mortgage: Also known as ARMs, these mortgages have an initial fixed interest rate for a period of three, five or 10 years. When that period expires, your interest rate is adjustable for the rest of your loan. During the initial period, this loan typically features lower interest rates and monthly payments compared to fixed-rate loans. This could be a good option if you plan to move in a few years or flip the house. For this type of loan, U.S. Bank requires a 740 credit score or better. Federal Housing Administration (FHA) loan: This is a government-backed loan. Compared to a conventional loan, FHA loans have more flexible lending requirements meaning the interest rates can be higher. You’ll need a monthly mortgage insurance for the duration of this loan. FHA loans are available as a fixed-rate or adjustable-rate mortgage. If you have limited funds available for a down payment or a low credit score, this may be an option for you. VA loans: These mortgages are backed by the Department of Veterans Affairs. If you are a current or former member of the U.S. Armed Forces or National Guard (or the current or surviving spouse of one), you may be eligible for this mortgage. Some benefits of this loan include little or no down payment, no mortgage insurance premiums required and simplified approval process. Jumbo loan: Jumbo loans are higher value mortgages. You may need one if you plan on buying a house that’s more than the current conforming loan limit. Jumbo loans are available as fixed-rate or adjustable-rate loans. One thing to keep in mind that the interest rate will likely be higher as these loans are considered riskier for lenders. Construction loans: If you want to build a new home, this is the loan you’d need to finance the construction. Investment Property loans: Determined to become a landlord? U.S. Bank offers investment loans for second homes and investment properties including one- to four-unit properties and vacation homes. One option offered is to use your current home equity to finance buying an additional property. Refinance: U.S. Bank has a number of refinance options if you’re hoping to find a better interest rate or a lower monthly payment. Depending on whether you’re refinancing a government-backed loan such as a VA or FHA loan, you have options to “streamline” the process. U.S. Bank has information on every type offered. What Can You Do Online With U.S. Bank Home Loans? U.S. Bank offers a robust website that has the option for you to prequalify online. While you can meet with a mortgage representative in person or call one, the company allows you to apply for pre-qualification via an online application. It’s great for those who prefer digital or who want to save time. 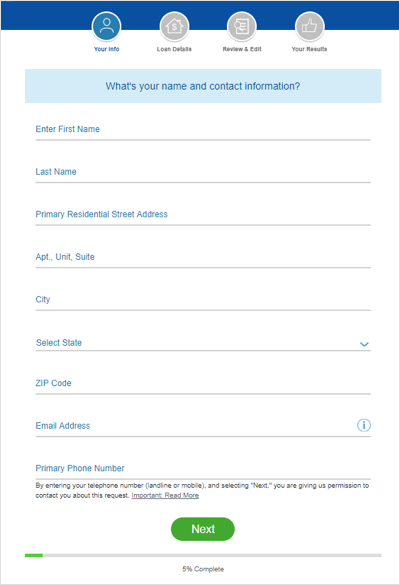 If you’re already a customer of U.S. Bank, you can sign into your existing account and then apply for pre-qualification. New customers will have to create a login through the website. You can find all sorts of loan information on U.S. Bank’s site. There are step-by-step guides to the home buying process, a glossary of terms and an explanation of fees, as well as information for every type of loan offered by the company. If you want to crunch numbers, you can check out the current interest rates for the type of loan you’re hoping to get. While you can prequalify online, if you want to start an actual loan application, you will have to get in touch with a loan representative either in person or via phone. There’s a location finder and numbers listen on every page of the mortgage site. The company also features a mobile application in addition to the online site, giving you the freedom to check your accounts on the go. Would You Qualify for a U.S. Bank Home Loans Mortgage? Your finances will be thoroughly analyzed before you’re offered a loan. For conventional ARM loans, U.S. Bank requires borrowers to have excellent credit, which generally means a FICO score of 740 or higher. Jumbo loans need a credit score of 700 or higher. U.S. Bank doesn’t specify what scores it requires for the rest of its loan offerings. You’ll have to initiate an application or speak to a representative to find out. If you don’t have a decent credit score, be prepared for higher interest rates, but you probably won’t be completely excluded from loans. Some of the options, like FHA mortgages, are usually available to borrowers with less than stellar credit. Another element that plays a factor into loan qualification is your down payment savings. Twenty percent of the cost of the home is the normal percentage for conventional loans. If you have less than that amount, you’d likely have to get private mortgage insurance to help insure the cost of the loan. Your income and debt also determine your lending worthiness. If you have high monthly liabilities, such as a large student loan payment, car loan or credit card debt, and don’t have a high income, you’re less likely to qualify for a loan. You can learn all about debt-to-income ratios with our guide. What’s the Process for Getting a Mortgage With U.S. Bank Home Loans? To apply for a mortgage with U.S. Bank, you can call its customer service line, use an online form to request a call from U.S. Bank, or meet with a mortgage loan officer in person at one of the branches. You can jump start the process and apply for pre-qualification on its website. Like many mortgage lenders, you’ll need at least a 620 credit rating and 24 months of steady employment to be eligible for prequalification. The exception is the jumbo loan where you’ll need a FICO score of 700 or higher with at least a 20% down payment. During your conversation with the mortgage loan officer, you’ll provide your name and address, an overview of your financial history (i.e. debts, income) and your goals for a monthly payment to get prequalified. The next step will be gathering your documents for verification to get pre-approval on a mortgage. U.S. Bank will need to see documents in four main areas: residential history, employment and income history, personal assets and personal debt. You will need to provide your home address for the past two years, as well as your landlord's’ name and address if you rented during that time. For employment and income verification, you can expect to show pay stubs from the last month which show your year-to-date earnings and W-2 or I-9 tax forms for the past two years. In terms of your personal assets, you may need to provide the past two months’ worth of bank account statements and any asset statements for stocks, bonds, IRAs or other funds you plan to use toward your down payment. If you already own real estate, you will likely have to provide documentation on that, including addresses, current value, your current mortgage lender’s name and address, as well as information about that home loan. With regard to your personal debt, you may be asked to disclose any car, student or home loans not listed on your credit report, plus all credit cards. Your loan originator will let you know if you need to supply additional information. Once your assets have been verified, you may be pre-approved for a loan. Be aware if you move forward with your application, you may need to provide additional documents at the mortgage closing. Your loan originator and real estate agent will let you know what they need from you. U.S. Bank is one of the most widely available lenders. You can get a home loan for all 50 states and, the company has physical locations in 29 states. Not only is the bank easily available, but it's also one of the biggest banks in the U.S., which means robust consumer offerings. This means if you prefer all your financial needs bundled at one institution, U.S. Bank offers that. Unlike companies such as Mr. Cooper or Caliber Home Loans, U.S. Bank is a full-service banking institution, not just a mortgage lender. Some of your other options include checking, savings, credit card and investing accounts. The company also offers online pre-qualification, which is a service the aforementioned lenders do not offer. In fact, most mortgage-only lenders tend to only offer phone or in-person pre-qualification. That's a huge advantage if you'd like to complete that step from behind your computer, rather than in person or over the phone. Preparation is key. This not only means doing extensive research into the various lenders that originate loans in your part of the country, but also taking into account your credit score. This is one of the principal factors in what will eventually determine your interest rate, so know what your report says. If no matter how much information you take in, the prospect of getting a mortgage is still overwhelming, you may want to consider professional help. Certain financial advisors in your area will have the ability to help you through this time in an effort to keep your financial life strong and intact. How do you find these advisors? The SmartAsset financial advisor matching tool is a great way to get paired with reliable advisors that have experience taking care of situations like yours.